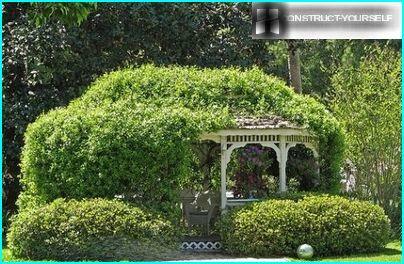 The cozy garden, decorated with colorful islandsblooming flower beds, in harmony with the carefully shaped canopy of trees, it is the pride of all gardeners. 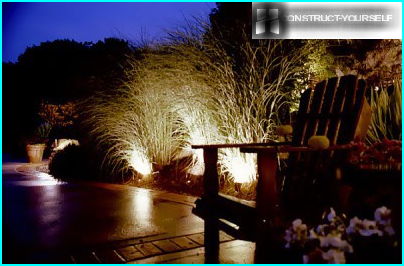 Overgrown vines for the garden, causing the admiration of its splendor, give the area a special appeal. After all, with their help you can give your favorite vacation spot special charm. 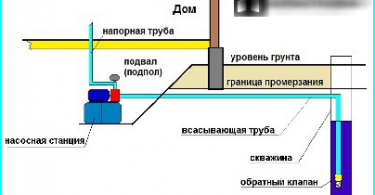 We offer you some examples and tips. 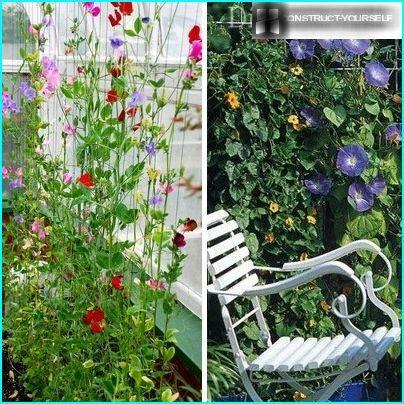 Perennial climbing flowers are among the mostpopular elements of vertical gardening. 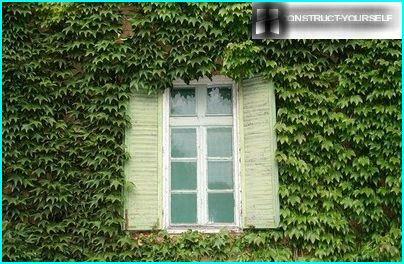 With braiding plants can successfully decorate the walls of any unsightly buildings, mask old stumps and trees. Fast-growing vines are indispensable forcreating a cozy, hidden from curious views outsiders corners. 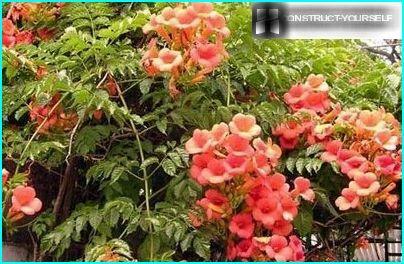 In addition to flowering vines themselves are amazingly effective, they can do more and practical significance. In addition, the overgrown vines on supports are the "living" barrier that protects the area from dust, noise from the street, and thereby improving the environment area. 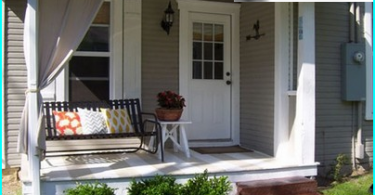 With the help of climbing plants you can create elegant picturesque alley, meet and lead the hosts and their guests from the gate to the door of the house. 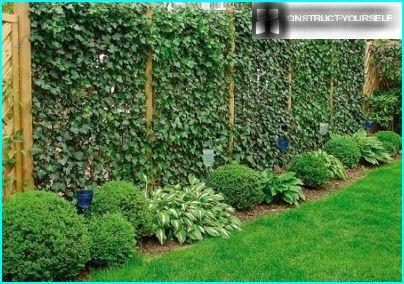 Annual vines are good for the garden atarrangement of flower beds and creating different levels of vegetable compositions. Beautiful annuals ability to rapidly increase the crop enables florist create real masterpieces and scenic landscapes in the garden. 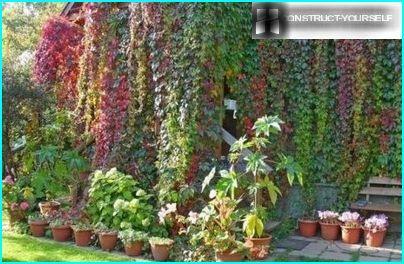 Very attractive look of hanginghanging pots flowering vines sprawled on the Scourge that flower garden, giving it a special charm. 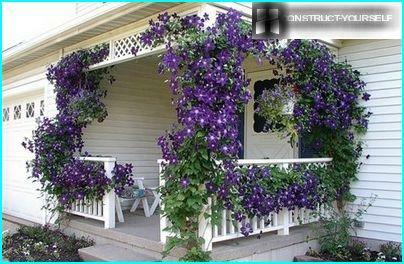 The colorful cascades of flowering vines are often used in the design, porches, loggias and balconies. Novice gardeners choice among the variety of climbing perennial flowering plants is better to give preference to varieties that are not particularly demanding on the growing conditions. The stems of morning glory is decorated with numerousgramofonchiki flowers, and sweet peas - whimsical "dog", exuding a refined flavor. Unpretentious light-loving, but freely carrying small shade plants, will please abundant flowering from mid-June to the end of autumn. Lemongrass has a beautiful foliage and delicatewhite-cream flowers with a subtle pleasant aroma. Reminiscent of the vines. Shoots lemongrass can reach a length of 10-15 meters. Young vines woody vine Actinidia winding length can reach in a single season by 3.5 meters, the old shoots do not exceed the length of 6-8 meters. Both plants have not only an attractive appearance, but also delicious, but also useful fruit. Among unpretentious in the care of vines stands out well and Trumpet. 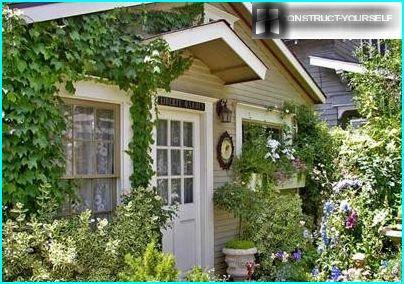 A special attraction famous wisteria, clematis, climbing hydrangea, climbing roses. But these plants are more finicky and require more attention to care. Clematis feels comfortable whenabove-ground part of the plant is located on a support and a well-lit sun and the soil at the base of the root system remains in the shadows. Because clematis afraid of frost, in the winter it is cut and harbor agrovoloknom, peat or old leaves. Clematis has many varieties, whichvariety of different shapes, sizes and colors of flowers. The most famous decorative variety: Alenka with lilac flowers in the shape of bells, Maidwell Hall with large purple semi-double flowers, Blekitny Aniol with bluish petals slightly wavy, Romantika with an almost black velvet flowers and Hagley Hybrid with pale pink flowers with a diameter of 8-10 cm. Roses do not leave anyone indifferent, charmingtheir beauty, tenderness and unique aroma. 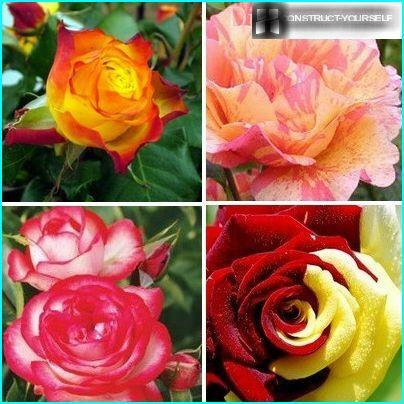 Breeders do not cease to please fans of the new varieties of flowers roses evolved marvelous hues and shape of petals. Curly in height from 5 to 15 meters. 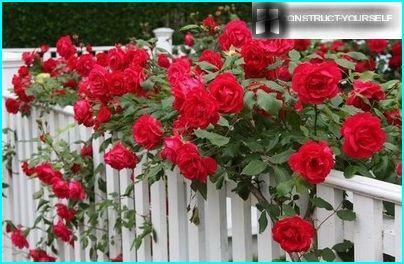 Of the many thousands of varieties, withdifferent height of shoots, the shape and size of flowers, every gardener can choose the rose bush, which will become effective addition to create beautiful landscape design. So, all rabmlery differ abundant andDuration of flowering, as well as a beautiful glossy foliage, preserving their decorative effect up to the frost. It is frost-resistant varieties are resistant to disease. 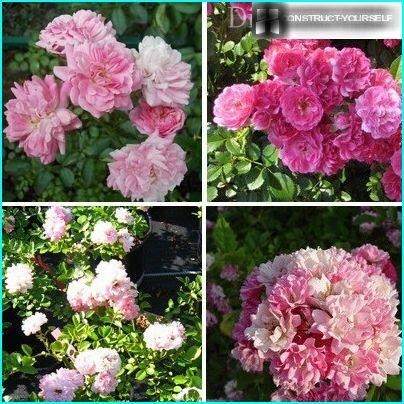 Roses can grow in partial shade, but most decorative flower show in open sunny areas. 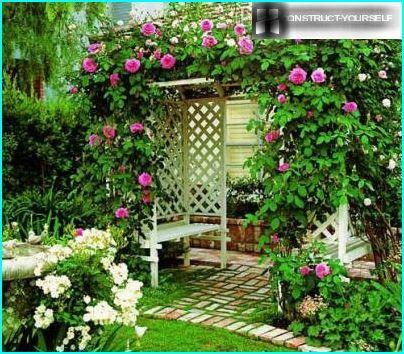 Making walls gazebos rose bushes, you canget the perfect opportunity to enjoy not only the unique beauty of the numerous inflorescences, but also wonderful sweet aroma, spreading across the garden. 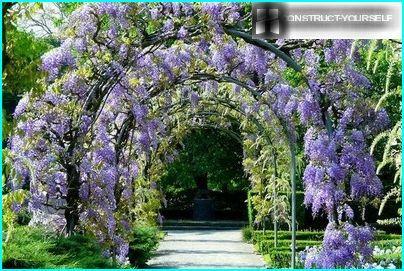 Wisteria frost is not known, butnew varieties developed by breeders, able to withstand freezing temperatures are low enough. For example, Wisteria floribunda quietly tolerate a decrease in temperature to -21 ° C, and Wisteria macrostachya - to -40 °. 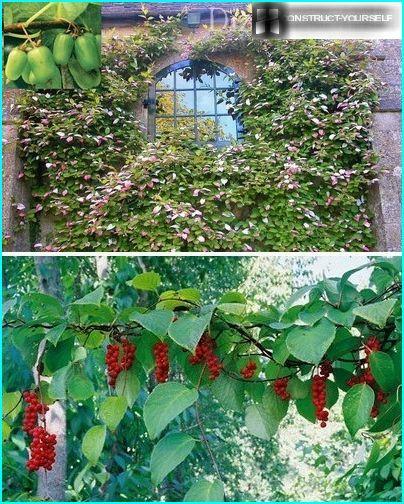 Choosing among Dekorativnolistvennye curlyplants, which though not luxurious blossom buds, but please look beautiful foliage unusual shape stands out most famous gardeners ivy. Evergreen looks extremely beautiful in any season, for speaking background blooming flower beds in warm weather or in the winter garden soloist among snow. Wild grapes well suited for decorating the north-eastern walls of buildings. Among a variety of species of plants,different shape and color of the leaves, the most widely used Japanese and girlish grapes. Dark green foliage, dense carpet of harboring the walls of buildings, in the fall painted in rich burgundy color, giving the building a new, but no less spectacular view. No less attractive are known as hops and aristolohiya. Not demanding special conditions plants can easily take root even in the depleted soils.